I am getting to know a new small camera that can be used underwater. A camera that doesn’t mind a rainy day or a swim in a river, or maybe the odd little bump. It hasn’t had much use yet but here are a few pictures from a canoe trip the camera has recently been on. 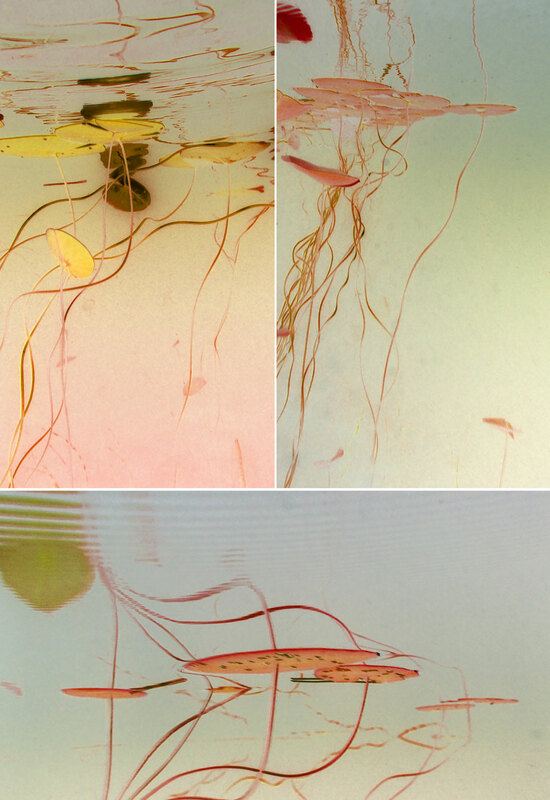 River lilies that have been inverted in processing to bring out the lovely forms. Lots of possibilities to explore, not enough time! these are just stunning Karen, reminiscent of your jellyfish. Such graceful flowing forms. The colour shift takes them into another world. Thank you very much, Anna. I, too, was reminded of the jellyfish, love that sort of form. Brilliant, Karen! Truly lyrical, extraordinary. Love your comments, Elena, thank you! I can’t wait to experiment a bit more with underwater images. Thank you for your feedback, I’m glad you like these. Yes, the camera is an Olympus Tough TG4. Just a point and shoot really (my first!) but shock resistant and waterproof to 50ft so it’s perfect for those times you don’t want to lug around an SLR that needs much more careful handling. It also has great capability in low light. It’s proving to be rather fun! So so so lovely, drifting underwater…. Thank you, yoshizen! I hope you summer is going well. Karen, these are beautiful, like ethereal modern art, graceful and fluid. Thanks for sharing. The grace of lilies… I find the reflections really interesting. I’m glad you like these images, thank you! The way the forms reflect on the underneath of the surface was surprising to me, I guess it is another world under there. Thanks for your comment, Sue. Quelle belle série, comme de délicats bijoux….merci! Hi Marina, a new world to explore, I’m glad you enjoy these. Fabulous Karen! That’s a cool camera! It’s just a little point and shoot really, but it’s much more affordable than an underwater housing for an slr (although I’d love one!). And it’s perfect for backcountry adventures where light and durable are what you need. I’ll be stepping into the rivers more often. Wow, these are super cool! So soft and beautiful and otherworldly. They almost seem like something from a book. The tones remind me of old illustrations, too. I thought of the images from The Water Babies, which is on my bookshelf and belonged to my mother when she was a child (before I filched it!). Brilliant idea! A little like a masao yamamoto photograph in colour.. Thank you, Cath! That’s an interesting comparison, I tried these images converted to black and white but these colours won out. I’m not overly familiar with Masao Yamamoto but an image search turns up some loveliness. These are lovely, Karen. The inversion really emphasises the line; they look like delicate paintings. Karen – these are lovely. I look forward to seeing what else you and the new camera will find! Beautiful, creative use of a waterproof camera. Very creative – they turned out awesome! Wonderful – I love these! Yep, I love these, different than anything I’ve seen, the inverted colours are amazing! Oh, these remind me of Susan Rothenberg paintings. Not the compositions so much (I like yours better- more dynamic) but the painterliness and the palette. Just beautiful! Looking forward to more experiments! Subtle and beautiful.Just like Art Nouveau artwork. Wunderschöne Fotos! Ob es unter der Wasseroberfläche meines Teichs auch so aussieht? Absolutely gorgeous! Thank you for sharing these. It’s art! Stunning pictures from this camera! Beautiful and surreal shots Karen ~ your creativity really produces magic. Cheers to a great week. Wonderful processing. I’d love an underwater camera.